Don't I need to know how to dance? And don't I need a dance partner? 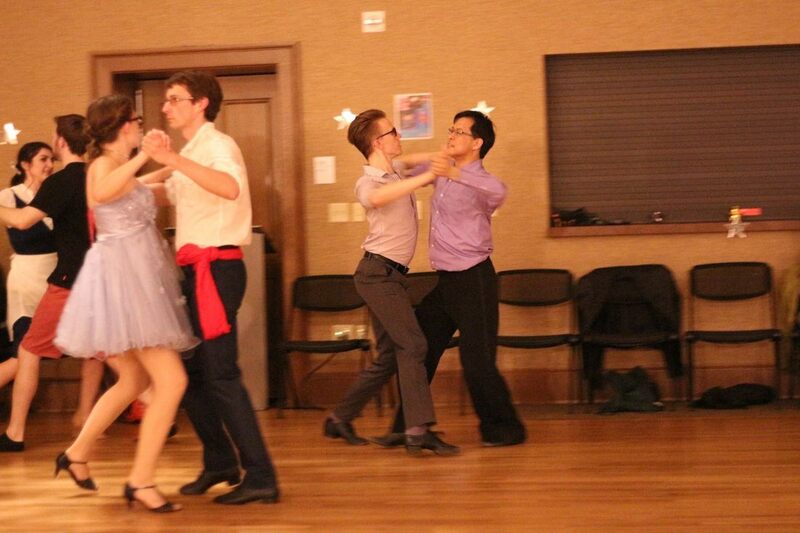 We are a social club dedicated to showing people the joy of ballroom dancing. When you're at a dance, we simply want you to have a great time meeting new people and dancing. Plenty of people come to dances just to learn and to have fun. For the most part, they come without partners. A lot of people are always willing to help you learn, even if you are a brand new beginner. You never need to bring a partner! You do not need to be experienced! We dance simply to have fun! Who can help me learn? Most of our new members come to the club having no experience in dance at all. If you've noticed someone who looks like a good dancer now, you can be pretty confident that not very long ago, he or she was an absolute beginner too. In general, our members are quite aware of their own humble beginnings and are very gracious about helping new dancers learn. Just stop by the admissions table at any dance and ask the person working there to point out one of many helpful people willing to teach you. At many dances, these people will wear yellow "Ask me to dance!" badges to make them easier to spot! We are a UW-Madison student organization, so we actively promote our events to college students. In fact, the great majority of our members attend UW-Madison. However, you do not need to be a student to come to dances or to join the club. Everyone is welcome! If you're not a UW student, faculty, or staff member, or the guest of one, please e-mail us so we can list you as a guest of the council. If you do fall into one or more of these categories, you are welcome to invite up to 2 guests who do not fit those requirements to an event! What's this First Dance Voucher thing? Good question! The First Dance Voucher is a BAM program that allows you to try out the club for the first time, risk-free! You simply pay for whatever lessons or dance you would like to attend, and then ask for a voucher. This voucher will document the amount of money you spent at your first dance, and if you choose to purchase a membership later on, that amount will be deducted from the price of your membership! Example: The first time you come to a BAM Dance, you pay for a beginner lesson ($5) and admission to the dance ($5). You receive a voucher documenting that you spent a total of $10 at your first dance. The next week (or any time later on), you decide that since you had such a great time before, you would like to purchase a semester-long student membership. The price of this membership would usually be $15, but since you have your voucher for $10, the price of membership is now only $5! Ask a Council Member if you have any further questions! Isn't ballroom dance music boring and dull? You're probably thinking about the kind of dancing you find in old movies, with men in tuxedos and women in full gowns - dancing to a full orchestra. Granted, that is ballroom dance, but the scene has changed a lot since then. We often dance to modern music combined with a fun mix of big band swing, latin, oldies, and disco. After you've been dancing just a little while, you will be able to pick out a lot of ballroom dance music on top forty radio stations. 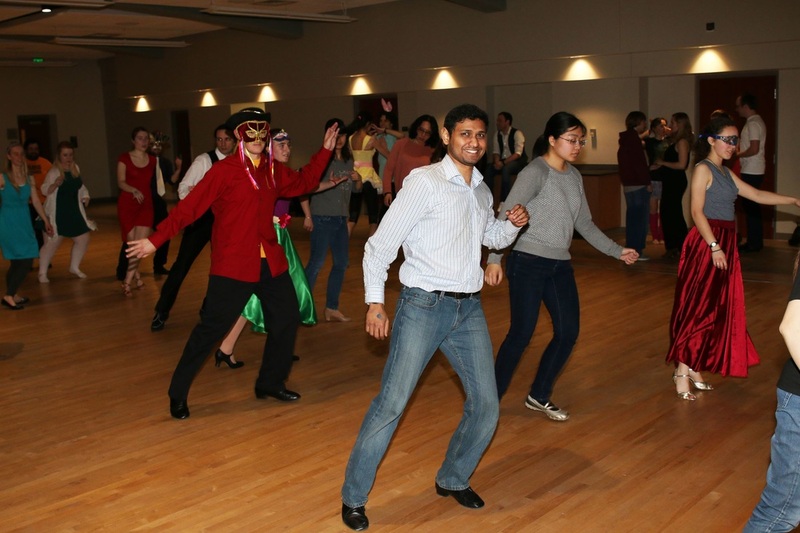 Most of our dances require only casual attire -- jeans and a t-shirt are just fine. Some wear a dress or slacks and a nice shirt. For one or two dances a semester we dress up if the dance is listed as a formal or semi-formal on the Dance Schedule. It's best to wear short sleeves so that you won't be too warm while dancing. Bring a change of shirt if you tend to sweat a lot. Wear comfortable shoes. However, running and cross-training shoes tend to grip the floor a bit too much, making turns more difficult. Dress shoes often slide better and are usually best. Avoid flip-flops, crocs, boots, platform shoes or extremely narrow-toed shoes as these can make dancing difficult, if not painful. If this is your first time dancing, just wear what's comfortable. As you continue to dance, ask more experienced club members about shoes specifically designed for dancing. We occasionally invite a vendor to sell dance shoes at a dance. I'm a man/woman; so, do I have to lead/follow? All instructors are asked to teach their lessons in terms of 'lead' and 'follow' rather than 'man' and 'woman'. So you are welcome to take a lesson as lead or follow, regardless of gender; and, you are welcome to dance with whomever will dance with you. How can I join BAM? You can join the club at any dance! or lesson! Just come to the admissions table. BAM memberships are available at student and non-student prices and can be purchased for a single semester or for the entire year. (Annual memberships are available only in the fall). You do not need to be a member to attend the dances. However, with Membership you receive discounted admission to all BAM dances, free lessons before many dances, and discounted access to the weekly lesson series. 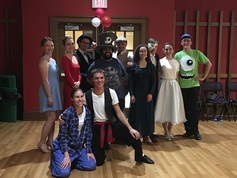 Members and non-members alike are welcome at all dances. Click here to learn more about becoming a member.